WBC's Foundations Program offers well-rounded dance curriculum in Ballet, Jazz, Contemporary, Tumbling, and Flexibility/Conditioning. Quality and technique are always emphasized in our fun, motivating classes which incorporate the American Ballet Theater National Training Curriculum. We strive to help our dancers build self-esteem, discipline, and creativity. Our experienced and caring teachers create a non-competitive, inspiring environment in which our Foundations Students flourish! EVERY STUDENT COUNTS! Formal training begins in Basics 1 Ballet. Emphasis is placed on correct ballet technique without compromising self-expression and personal development. Classes incorporate the American Ballet Theater Curriculum which focuses on teaching classical ballet safely and correctly. Dancers perform exercises at the barre and in the centre which develop balance, flexibility, and strength. By the end of the year, all of the positions of the feet and arms will be learned and barre and centre combinations will increase in complexity. Students must attend class two times a week to facilitate development. In Basics 2 Ballet, exercises continue to increase in length to train the dancers' minds as well as their bodies. Through the repetition of correctly performed exercises, the students continue to develop muscle memory. Students must attend class two times a week to facilitate development. In Youth Ballet, the intensity of study continues to increase. Exercises lengthen and more complicated movements are introduced. The study of and use of the arms and different body positions has become more complex. As part of the curriculum, students participate in Pointe Prep. This is for students preparing for, or beginning, pointe work. Students will be evaluated on technique, strength, flexibility, and physical maturity. After individual evaluation by the teacher, some dancers in Youth 2 will make the transition to pointe shoes. Until then, students will participate in the class without pointe shoes. By doing the conditioning and barre exercises, students will work toward building the strength and technique necessary to begin pointe work. Students must attend class two times a week to facilitate development. *Our Ballet Classes incorporate the ABT National Training Curriculum. Read about it here! 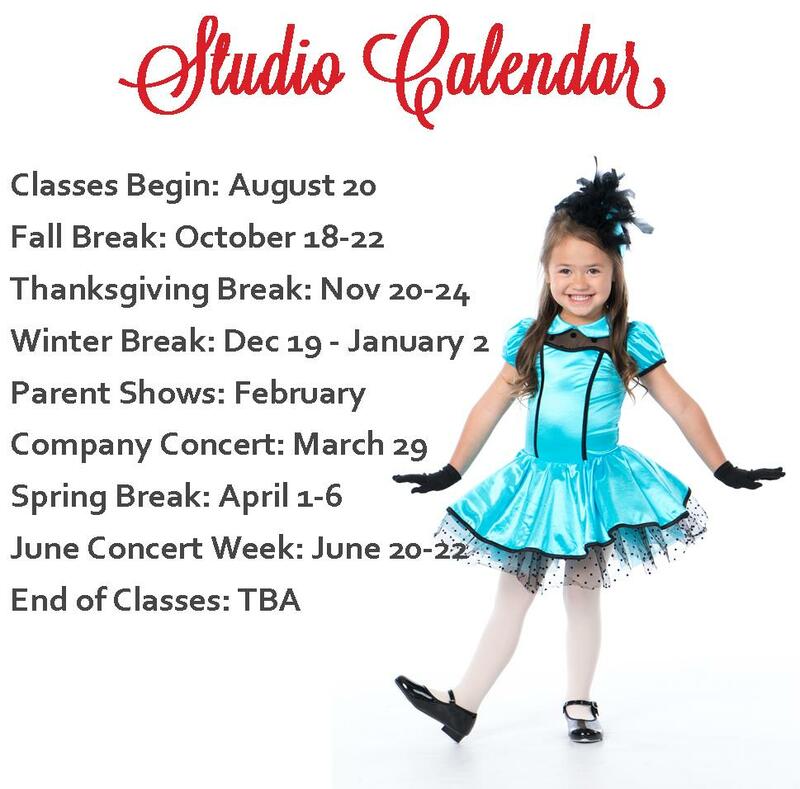 As part of enhancing and rounding out the dancer's study of dance, WBC offers Performing Companies for the Youth, Intermediate, and Advanced levels. After auditioning, dancers rehearse weekly to learn choreography of all styles and then perform at various venues throughout the area. ​See our Performing Companies page for more details! Geared toward dancers, this class will help our students be even more versatile and strong! This class builds strength and flexibility. Class is a lot of fun and is open for anyone ages 8 and up. Please note tuition is figured as usual unless you are on the Unlimited Dance Class Plan. For further details, see our tuition page. This class benefits our students by teaching them how to work with their body to maintain its maximum flexibility and strength. This year’s teacher, Jen Cowley, has a Bachelor’s degree in Exercise and Wellness with a Minor in Contemporary Dance and is Pilates Certified. For Youth – Advanced level dancers. 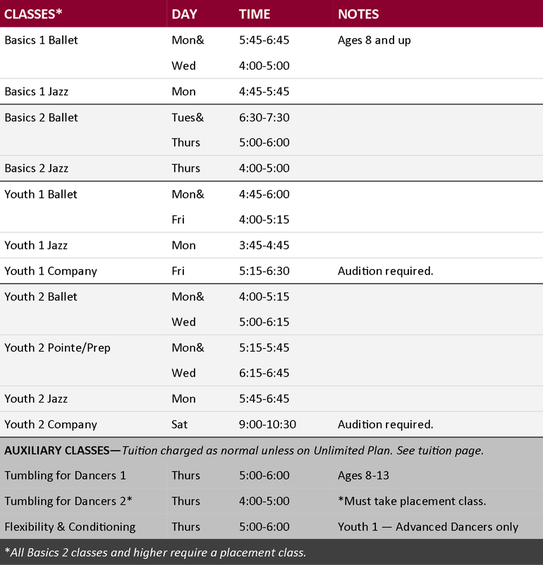 ​Please note tuition is figured as usual unless you are on the Unlimited Dance Class Plan. For further details, see our tuition page.